They don't want to take their country back. They just want to leave it behind. As the dust settles in the wake of President Obama's decisive reelection last Tuesday, the White House petition website has been flooded by a series of secession requests, with malcontents from New Jersey to North Dakota submitting petitions to allow their states to withdraw from the union. Most of the petitions submitted thus far have come from solidly conservative states, including most of the Deep South and reliably separatist Texas. But a handful come from the heart of blue America - relatively progressive enclaves like Oregon and New York. All told, petitions have been filed on behalf of 20 states: Alabama, Arkansas, Colorado, Florida, Georgia, Indiana, Kentucky, Louisiana, Michigan, Mississippi, Missouri, Montana, New Jersey, New York, North Carolina, North Dakota, Oregon, South Carolina, Tennessee, and Texas. Many of the petitions invoke the Declaration of Independence's dramatic assertion that "Governments are instituted among Men, deriving their just powers from the consent of the governed, that whenever any Form of Government becomes destructive of these ends, it is the Right of the People to alter or abolish it, and institute new Government." For some of the states represented, the secession requests are nothing novel: South Carolina, the state whose 1860 secession sparked the civil war, is hardly an unlikely locus of conservative angst in response to Mr. Obama's victory. And in Texas, which still conceives of itself as a "republic," not a mere "state," politicians seem to make an almost annual show of flirting with secession, periodically dropping dark hints that Washington's chicanery may force the Lone Star state to flee the Union. After repeatedly nodding at the possibility of secession in the last few years, Gov. Rick Perry, R-Tex., has more recently kept mum on the subject. But some local GOP officials in Texas have been happy to fill the void: Tom Head, a county judge from Lubbock predicted in August that Obama's reelection could lead to a second civil war. And the treasurer of the Hardin County Republican Party, Peter Morrison, asked in a post-election newsletter, "Why should Vermont and Texas live under the same government?" Morrison's newsletter requested an "amicable divorce" from the "maggots" who reelected President Obama, many of them voting on an "ethnic basis." 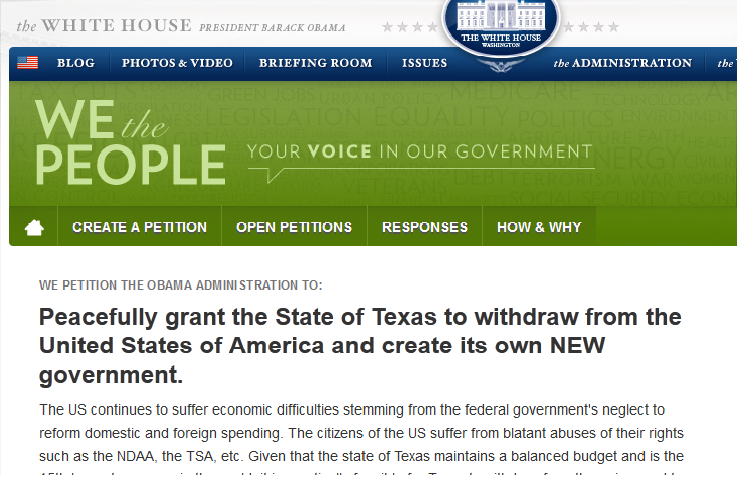 The Texas petition assails the federal government's "neglect to reform domestic and foreign spending," arguing that "it is practically feasible for Texas to withdraw from the union, and to do so would protect it's citizens' standard of living and re-secure their rights and liberties in accordance with the original ideas and beliefs of our founding fathers which are no longer being reflected by the federal government." But some political officials in the states involved are not so eager to hop onboard the secession bandwagon, post-election angst or not. Morrison's boss, Hardin County GOP Chairman Kent Batman, explained, "People around here are asking why Texas is so different from the rest of the country, why we see things so differently...but I don't think a lot of people here are saying we ought to leave the Union." Asked about Morrison's newsletter comments, the Fort Worth Star-Telegram reports that Batman sighed and replied, "Wow...OK, well, I guess I need to start taking a look at his newsletters."